Is Alexei Emelin worth Keeping? Alexei Emelin can be a polarizing player for the Montreal Canadiens. When the defenceman is on his game, he is hitting everything in sight and driving the opposition crazy. But when he is off his game, pucks are given away at an alarming rate and defensive positioning is virtually non-existent. Emelin’s name has been brought up as a player to trade but his cap hit ($4.1 million) and term (another three years left on the deal) make him hard to move. He brings a unique skill set to the Habs despite his struggles so it begs the question, is it worth it to keep Emelin? Despite being drafted back in 2004, Emelin did not make his North American appearance until 2011 when he joined the team in what was a horrible season for the Habs. Playing in Russia, Emelin was a physical force but didn’t show much of an offensive upside until his final season when he put up 27 points in 52 games for the KHL’s Ak Bars Kazan. At 6′ 2″ and 217 LBS (according to NHL.com), Emelin is built like a tank and has more than a few highlight hits to his name. Emelin has some offensive ability as he has 13 points in 54 games so far this season and a decent shot to his credit. Ever since Emelin hurt his knee trying to take out Boston’s Milan Lucic, his game for the most part has taken a dive. He finds himself out of position trying to make hits and when the puck is on his stick, it isn’t pretty to watch on some nights. Emelin is a talented player as he has shown in the past he can be a serviceable guy in the top four but is now a bottom pairing player. He played better when paired with fellow countryman Andrei Markov but Markov has a history of making mediocre players look good. Coach Therrien has continued to play Emelin but the fans’ patience with him is running low. He was given some leeway when joining the team in November 2013 after his recovery from surgery but fast forward to February 2015 and he is still struggling to find his pre-injury form. 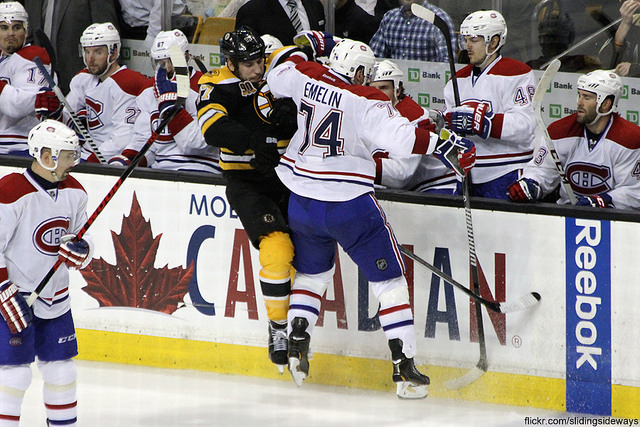 When Montreal plays the Boston Bruins, it is where Emelin plays his best. Whether it has to do with his rivalry with Lucic or the excitement of playing an archrival, Emelin thrives playing in these games. Lucic absolutely hates Emelin and has taken numerous runs at him over the years which include a few big hits and spears to the groin. It is games like these where fans can finally see Emelin’s value. He plays the body, often destroying players while irritating the opposing team as both Lucic and Zdeno Chara have wanted a piece of Emelin. With the way Emelin is playing, he is hard to trust. When the pairing of P.K. Subban and Andrei Markov isn’t on the ice, the Habs’ overall game is nowhere near as effective compared to when they are on. Emelin struggles in his own end and is a defensive liability but no other Hab brings Emelin’s physicality and penchant for big hits to the table. No doubt Marc Bergevin jumped the gun in signing Emelin to his deal as Emelin was still recovering from knee surgery at the time of the contract. Emelin needs to find the consistency expected of him or he could be finding himself with a new address sooner rather than later.